The Jazz Age ballroom style, a style I like to refer to as "Cocktail Dancing", is unique in its simplicity, intimacy and freedom. It is the dance of an age when everyone danced, when people were participants rather than just spectators in their own entertainment. What follows are some helpful hints for dancing in this style. In this style of dancing, very little of the lead comes from your hands and arms, and most of it from your body - your "core". Since you are in body to body contact, the two of you should move effortlessly as a unit. The desired effect is smoothness and musicality. The Lead should adapt to the music, dancing smooth and romantic when the music is smooth and romantic, and exuberantly when the dance is exuberant. He should sway and move his body to the music and convey that movement to his partner. The movement starts with the shoulders and works its way down as the body follows the shoulders. However, being in such close contact imposes some constraints. Your movements can't be too violent or broad, your feet can't do anything that would cause stepped on feet or colliding knees and since you are so close together (perhaps even cheek-to-cheek) unless your partner is so short that her head is below your sight line, you can't really see that well, so Polka-style hurtling across a crowded dance floor could be a very bad idea. This encourages a partner-focused (rather than audience-focused), restrained style of dancing, with subtle nuances of movement that impact how the dance feels, but not much how it looks. You and your partner are having a private conversation (whether you speak or not), and not putting on a show. If you are the lead, it is important for you to lead. You need to give strong and unambiguous signals to your partner what you intend to do. If you are unsure or hesitant, you will give confusing signals. Therefore, on the dance floor, focus on what you know you know and do that clearly and confidently, even if it is pretty basic. 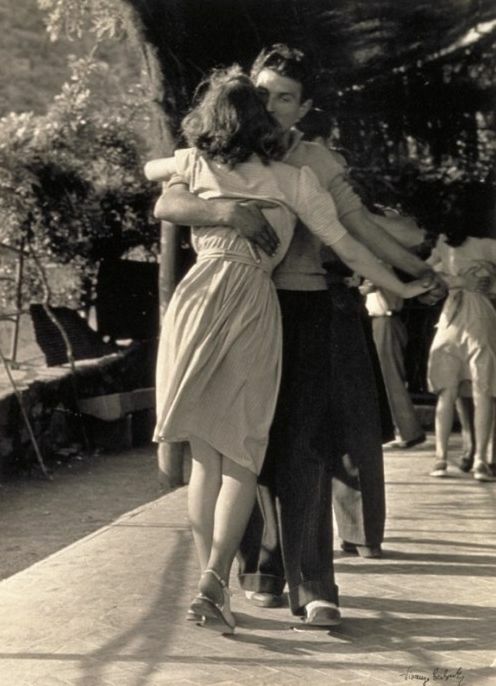 While you will often be called upon to go outside your comfort zone in a class, while social dancing, it is important to find a happy medium where both partners can enjoy themselves and neither is made to feel self-conscious or inadequate. As a lead, alter your dancing to fit your partner's strengths, weaknesses and preferences. If she is hesitant or doesn't seem to "get" some move you are trying to lead, don't press the matter, but emphasize what works for both of you. You're not putting on a show, and no one is scoring you on which moves you do and how well. As with a good relationship, try to find a place that works for you both, even if it means a bit of compromise. If you find you or your partner is off the beat, it's OK to stop, listen for the beat, sway a bit and then dance again. If you like, you can freeze in some dramatic pose as if to say "I meant to do that" when you stop. If you have a particular favorite step that that's more than just walking, take a little time at the beginning of the dance to bring your partner up to speed. It is also just fine, in my book, to say things like "Let's do a two-step" or "slow-slow-quick-quick", while demonstrating, to help give her a clue as to what you are up to. There are many dance teachers that say all communication should be non-verbal. I am not among them. Stay off her toes. Remember that your outside foot (the left) has a clear field of motion but your right, which passes between your partner's legs, does not. Unless your partner is experienced and proficient with long strides, be very careful with that inside foot, to include perhaps taking shorter strides with it. While I haven't found teachers of the period talking about this, with beginners I teach what I call "Safety foot - Danger foot". The "Safety foot" is the left foot that can take as long a stride as it likes as it passes to the outside. The "Danger foot" is the right, which passes between your partner's feet. I suggest taking a long stride with the left, but when you step with your right, come up even with the left rather than follow with another long stride - unless your partner is comfortable with that. Stay cheerful and focus on your partner and not on your memorized routines. One of the advantages of this close position is it's very hard to look at your feet. Don't even try. Keep your head up. Your feet will do a much better job if you relax and let instinct take over than if you stare at them. Pay attention to your surroundings and modify your dance accordingly. If the floor is crowded, keep your movements small and don't cause collisions or expect others to stay out of your way. And finally, remember that your partner isn't a prop, put there to help you display your dancing awesomeness. And here's your number one rule: it's your job to show a girl a good time. Adjust your dance to her comfort zone and NEVER embarrass her or make her feel stupid. If she's a more accomplished dancer than you, just do what you know how to do as well as you can and hope that she will be similarly indulgent. In this style of dancing, the key to following is relaxing and going with the flow. There are a lot of dance styles that require you to look for subtle cues to tell you to launch into a specific practiced routine. This is not such a style. Part of relaxing involves letting go of any tension in your dance position. Do not grip your partner's left hand but just touch it lightly. Do not (as you might in current ballroom styles) offer resistance with your left hand pressing against his shoulder. You don't need that to cue you that something is happening, since you are in close contact, and insisting on doing so will make it harder for you to feel the lead, and will leave your partner with a very tired right arm at the end of the dance. You are not looking for a "frame" with "dynamic tension", you are looking for a relaxed and easy connection. Following in the "Cocktail" style is a very "Zen" sort of thing. The less you think about it, the better it will work. There is a tendency of dancers who have danced other styles but not this, to try to lock into a specific rhythm or step without taking a cue from the lead. It is essential to relax and "listen" to the lead. One of the exercises I use in teaching is to have the follow close her eyes - and I know several dancers who just do that as a matter of course in this style. An important safety note: in most cases, always step directly forward or backward, and not to the side. If you step with your right foot out to the side, you will put it in the path of the your partner's advancing left foot. This isn't to say the communication is all one way. A good lead is attuned to the signals coming from the follow, and you as the follow should feel free to give those signals. If you want to be more close, snuggle up. If you want to be less close, don't. If you want to pick up the pace and be more lively, signal that - and if you want to slow down, signal that too. You can even say what you would like with words. And finally, this social dancing, and one social thing to do it chat. You don't need to be silent, and you don't need to focus on the dance to the exclusion of all else. Conversation on any topic is a valid and worthy part of this style of social dancing.